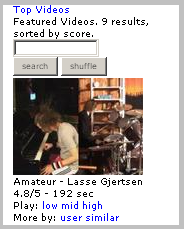 TinyTube.net is an independent mobile site that hosts 3gp versions of a lot of the current content on YouTube. The videos are searchable, and grouped by: Recently Added, Favorites, Highest rated, Most viewed and Most Discussed just like on YouTube. This is not a streaming site, each video is downloadable in low, medium or high quality. All three qualities are 176×144 with varying degrees of compression and of course size – low quality averages 300KB, medium 700KB and High 6MB. I don’t know how kindly Google will take to this seeing as they are rumored to have cut a deal with Verizon to offer YouTube content on the carrier’s 3G phones. Enjoy TinyTube while you can. I’ve put a link to it on the Yeswap.com portal under Entertainment/MobileVideo. i can not run in w850i mobile lah….